TMI Source’s ‘The Shadowhunter Chronicles’ Read-along starts today! Happy New Year, Shadowhunters! We hope you had a fun and safe New Year’s Eve. It’s 2018 so it’s the year of the Queen 😉 This time we’re not talking about Cassie, though, but Queen of Air and Darkness. The final installment of Cassandra Clare’s The Dark Artifices trilogy is going to be published on December 4 – who is excited/scared? 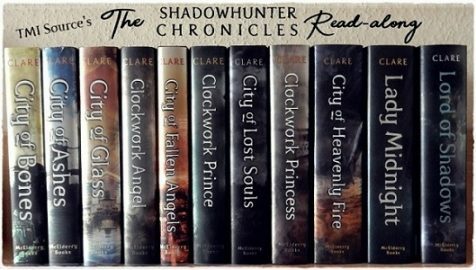 We know that’s it’s still 337 days until we find out how Cassie’s third series in her The Shadowhunter Chronicles is going to end, but we hope our read-along dedicated to nearly all of the books, which we announced just before Christmas, is going to help while we’re all waiting! If there’s time, we’re also trying to squeeze in The Bane Chronicles and Tales from the Shadowhunter Academy! We’re going to discuss each book on the last Saturday of the month on Twitter – dates above – unless otherwise stated. We’ll tweet questions about each book, share our favourite parts/quotes and much more! We’re also going to tweet about our reading progress using the hashtag #TSCreadalong and we hope you’re going to do the same so that we can keep track of everything. Furthermore, we’ve created a goodreads group where you can chat about the books while you’re reading them. Just send us a request and we’ll add you ASAP. Leave a comment below if you are going to join our read-along and please let us know if you do have any questions or ideas for improvement.